Sven Bender's fire for football has returned in new surroundings at Bayer Leverkusen, but with familiar faces, like twin brother Sven. Sven Bender – like his twin brother Lars – is a model professional, who puts his body on the line for his team. In an exclusive interview with bundesliga.com, the 28-year-old talks about his summer move to Bayer Leverkusen, his relationship with Lars and how Lucas Alario reminds him of Robert Lewandowski. bundesliga.com: You’ve been at Leverkusen for around three months now. How is the mood in the camp after a difficult campaign last time out? Sven Bender: I could sense from the outset that the previous season was gnawing at the team. The lads were good from the start but you could tell that in certain situations one or two of them would let it get to them. Their belief in their own strength seemed a little bit lost. Maybe you only notice that when you come from the outside, which was the case with me. But in the last few weeks it has got better step by step. I now feel that the lads believe in themselves again and are aware of the great quality that each of us has. 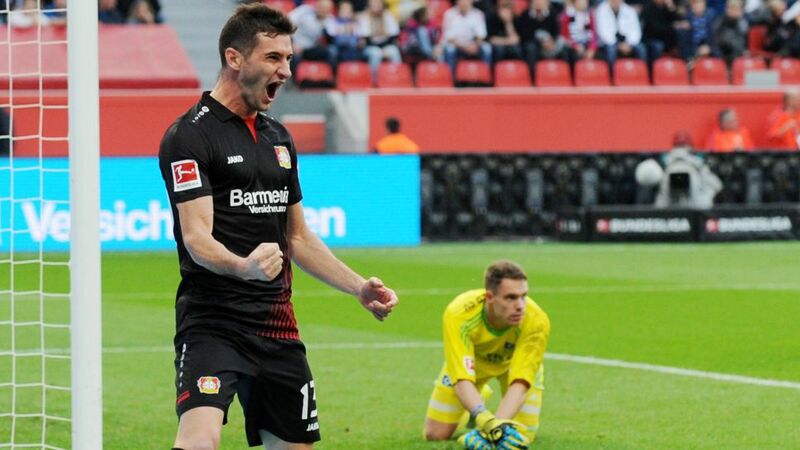 Watch: Lucas Alario loving life in Leverkusen! bundesliga.com: Let’s talk about Bayer’s new Argentine striker Lucas Alario, who says he has learned a lot from watching Robert Lewandowski. As a former team mate of Lewandowski, you must be able to assess that claim. Bender: I already had the impression during the first training sessions that Lucas reminded me of the time Robert Lewandowski came to Dortmund. I think Lucas is a similar type of forward to Robert. Obviously he’s only starting out but he has everything needed to become a top striker. bundesliga.com: What did your brother Lars tell you about the club when a transfer became a possibility? Bender: Lars said that Bayer is a highly-professional club – one with all the structures that a professional needs to be able to produce top performances on the pitch. I found everything that Lars had described here. We have the best conditions in every respect. bundesliga.com: You said recently that the prospect of a family reunion was not the reason for your move. But what it’s like being in the same team as your brother again after eight years? Bender: It’s incredibly fun to play with Lars. Obviously in the past eight years we often talked about football together and exchanged ideas. We’ve always noticed over the years that we still have almost the same idea about football – not only on the pitch but also for the many things off it. And even when we don’t agree, it’s impressive to see how intensively Lars goes about things. For me he’s a soulmate. And despite being older in footballing terms, the fire still burns for both of us. Bender: A new manager (Peter Bosz) arrived at Dortmund in the summer so the pack was reshuffled. But I still had the clear feeling that I had to change. I’m obviously aware that I had one or two injuries in the past. But even when I was fit, I didn’t necessarily play over the past two years.I was just not sure if I would be a regular starter with Dortmund anymore. You know, I often think about what it was like when I was a child. Back then, it was all about being on the pitch as often as possible. bundesliga.com: You could hardly be given a guarantee of a starting place at Bayer either though? Bender: That’s true. In our profession there’s no guarantee of starting. But I said to myself that I’m arriving as a new player and at Bayer I’m no longer the player who has been at the club for a long time already. No longer the guy who is OK with everything, never complains and accepts everything - as was the case in Dortmund. What was clear to me was that I had to perform well with Bayer from the off. Whether I play or not here depends on me and no one else. As an already-experienced player, I am expected to play an important role. But you have to be up to that role in the first place. That is the challenge and I just want to prove again that I can do it. Just like I showed often enough in Dortmund after injuries - that I’m hard on myself and can come back to my old level. In a nutshell, I just want to give it another go. Watch: Highlights of Leverkusen's draw at Schalke! bundesliga.com: After your last game against Schalke (when Leverkusen came from behind to draw 1-1), experts like Matthias Sammer spoke about the body language of the Bayer players. Is that a redundant discussion as long as the result is right? Bender: I do think that body language tells you a lot. When you signal by dropping your head that your belief in winning a game is no longer there, then you’ve already lost. With your body language you can show the man beside you, your opponent and not least the fans that you still believe in success. When the opponent thinks ‘they’ve just conceded but it doesn’t seem to have fazed them, they’re just doing their own thing regardless’ – that can have an effect. Especially in football, positive thinking and positive body language can move mountains. bundesliga.com: You’re the most frequently-injured player in the Bundesliga, although your brother isn’t far behind in this ranking. Bender: I think you have to take a closer look at these statistics because they are a bit misleading. It’s true that I had a lot of injuries at Dortmund. But with many of them I didn’t miss any games. After my nose breaks, for example, I didn’t miss a match. When I was sitting on the bench, the general perception was ‘he must be injured.’ But that was not always the case. Of course, though, I can’t argue with the fact that Lars and I have had a lot of injuries.